Eagles wide receiver DeSean Jackson ended his holdout and is back in training camp. "I'm just going to keep everything positive. I don't want to turn it into anything negative. I love Philadelphia. I love the fans here” Jackson said. Jackson didn’t practice in the morning, but he was on the field for the afternoon session at Lehigh University on Monday. The two-time Pro Bowl pick came to camp 11-days late. He's still hoping for a new contract. He’s currently slated to earn $565,000 this season, the final one of his four-year rookie deal. 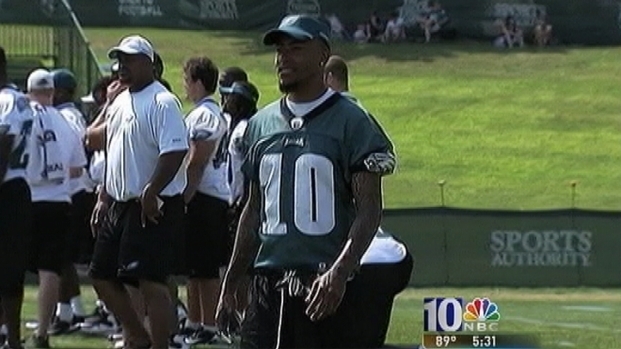 Eagles wide receiver DeSean Jackson ends his holdout and reports to training camp. If Jackson hadn't reported by Tuesday, he might have forfeited a year of service time toward free agency.